Tuscany Village is a lushly landscaped guard gated golf course community originally developed by local builder Jim Rhodes as the sister community to Rhodes Ranch. As the name implies, the area has a Tuscan theme straight out of old Italy, with its own bell towers, capella, obelisk and clock tower. Home sites meander around the Tuscany golf course, an 18-hole 6906 yard par 72 championship course designed by Ted Robinson. 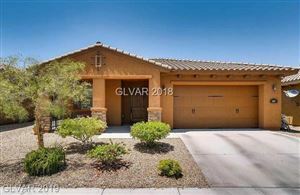 Nestled right beside exclusive Lake Las Vegas, this 526 acre master planned community is located on the northeastern edge of Henderson, just minutes away from McCarran Airport, the Las Vegas Strip and the Lake Mead Recreational Area. Central to community life is the 35,000 square foot La Tuscana Recreation Center, offering loads of amenities for both young and adult lifestyles. Indoors residents can take advantage of the world class fitness center, racquetball courts, billiards room, basketball courts, arts and crafts rooms and even a full kitchen for cooking classes. Outside are lighted tennis courts, lagoon pool, lap pool, spa, playgrounds, beach volleyball and walking trails with picnic areas. There is a full time staff devoted to planning all kinds of community activities, and personal trainers are available to keep you in shape. Tuscany Village is also just minutes from boutique shopping, gourmet restaurants, movies, a casino, day spa and entertainment at the internationally acclaimed Lake Las Vegas Resort. Regularly scheduled activities at Lake Las Vegas include the popular Wine Walks, Beer Festivals, jazz concerts by the lake, kayaking, canoeing and even an ice skating rink in the wintertime among many others. The communities inside Tuscany Village offer one, two and even three story homes with a wide variety of price ranges, and home sizes that range from 1271 square feet to more than 4000 square feet. There are both new and resale homes available for sale, and at completion Tuscany Village will have approximately 2400 residences and be home to almost 7000 residents. The luxurious town homes of Fiori offer three fabulous 3 story floor plans with two car garages ranging in size from 2106 to 2307 square feet. These beautiful residences are located directly across from the golf clubhouse and offer some amazing views of the Las Vegas Strip and course. Tuscany Village is different from most master planned communities in the Henderson/Las Vegas area as it has no extra tax improvement fees, commonly known as SIDS or LIDS. All residents also receive 50 free channels of cable television in addition to the other great perks of living in the community.